One of the most exciting things about reading your favorite books is the discussion that ensues when you get together with other people who are likeminded. The sucky thing is the situation wherein you find yourself totally into a book, and you can’t find people to discuss the book with. Of course, there are always forums and other venues online, but sometimes one can’t just be bothered to log in to those sites anymore. Now what if you had a platform where you can engage in real-time discussions with other people via your e-book reader? Assuming that you read your books in electronic format these days, this option should be a welcome one, as you will not have to exert a major effort to share your thoughts and opinions on what you are currently reading. 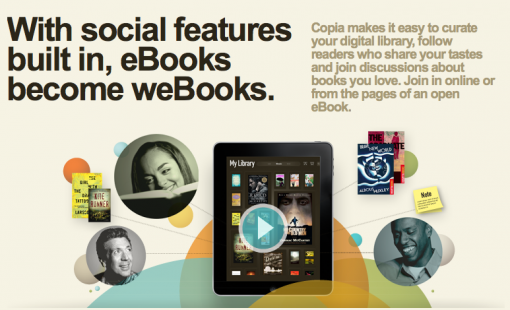 Copia is a platform which turns “e-books into we-books.” How so? People who use the platform can interact with other users straight from the pages of the book that they are reading. Think writing down thoughts as notes and then having other people see them and comment on them; and vice versa. I haven’t used it myself, but based on what I have read, you can also create your own library, rate books, and write your own reviews. The only thing is that it is only currently available for the desktop and the iPad. If it does take off, though, I think that versions for the Kindle and the Nook might just come out in the future. One thing is for sure – this concept adds the element of sharing to reading, and that can only make things more enjoyable. Souunds like an excellent technology! I will have to check this out!